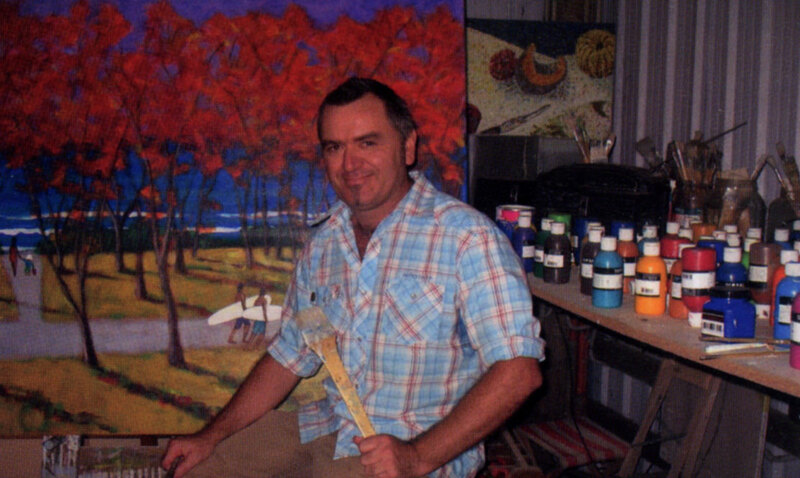 I am a painter currently living and working on the northern coast of New South Wales. My studio is on a beautiful cattle property on the edge of the historical town of Bangalow. I respond to colour. Since childhood, I have amassed an odd collection of trinkets, knick-knacks, photos and images – all connected through colour using harmonious or discordant palettes. This collection motivated and encouraged me to use my creativity, but it was during my formal art studies that I made the connection between my simple love of colour and art-making—and began to use colour to dissect and analyse my surroundings and gain an alternative appreciation of the natural beauty of the landscape. From this analytical deduction, I am able to convert the three-dimensional environment we live in into layers or blocks of colour and transpose these elements onto canvas, with a sense of renewed vitality and rhythm. Colour is very important to me. It has the ability to alter and uplift my mood, to enlighten and transform my perception of my surroundings and give me great satisfaction and fulfillment. The colours reflected in the natural environment of the Northern Rivers are magnetic and I was drawn here from Adelaide in the early 1990s. Since then, a common thread that connects all my works—regardless of the subject and my expressionist style—is a strong and intense colour palette. Working with acrylic paints allows me to develop one painting at a time—giving it my full and undivided attention. The minimal ‘drying time’ of these paints ensures I can respond to the subject and the canvas instantly—at the precise moment inspiration strikes. I endeavour to capture a moment in time—as a photographer would—but unlike a photograph, paintings allow me to contribute the energetic and passion I draw on from this region and how happy I am to be here. However, I believe paintings and art do more than just show how we, as individuals, interpret our surroundings. We endlessly decorate, elaborate and enrich our lives with colour and texture—providing stimulation for our senses and our mind.